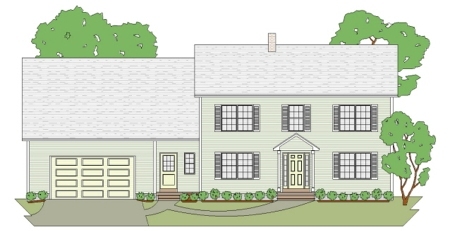 This 4 bedroom traditional colonial home works great for a family on a budget. It offers a very workable first floor plan, and the second floor it has 3 decent sized kids rooms with a double duty bathroom for them to share, and a master suite with a large closet and nice bathroom. 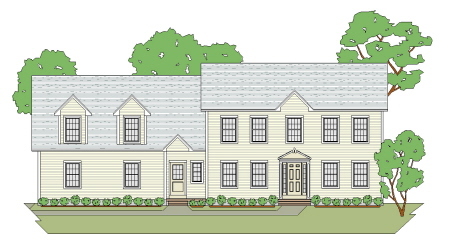 This 4 bedroom traditional colonial home plan is the same as the Andover A but it has a 2 car garage added. It works great for a family on a budget. 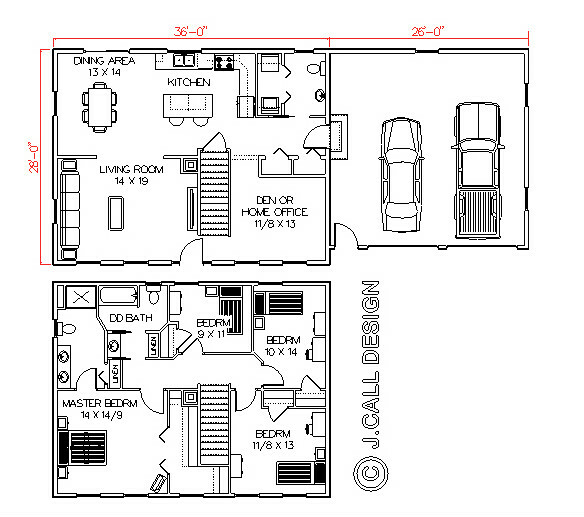 It offers a very workable first floor plan, and the second floor it has 3 decent sized kids rooms with a double duty bathroom for them to share, and a master suite with a large closet and nice bathroom. 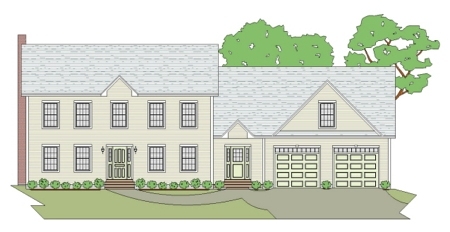 This 4 bedroom traditional colonial home plan is the same basic floor plan as the Andover A but it has the added advantage of a breezeway and a larger 2 car garage with a covered porch for company to walk under on a rainy day. We can delete the porch and change the garage doors to the front if you wish. 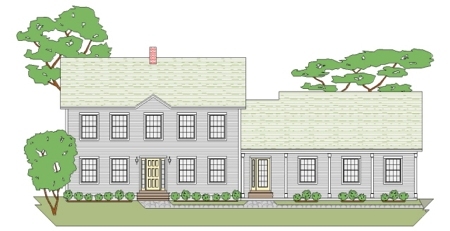 This 4 bedroom traditional colonial home plan has the look of an old farmhouse, but the inside is designed for today's living. The first floor has an open concept living area, a formal dining room, a den, home office or 4th bedroom, and a full bath. Upstairs are two large kids rooms which share a double duty bathroom, a laundry, and a great master suite. The large garage that will fit 3 cars has our easy entry to the full cellar. 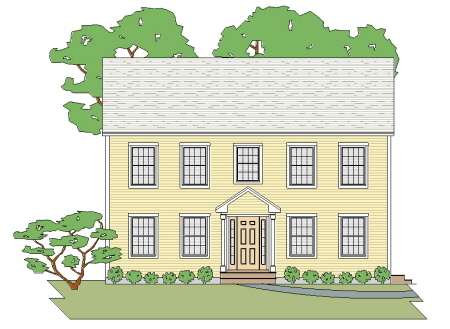 This traditional 4 bedroom colonial home plan looks smaller than it actually is. The first floor shines with a large living room, formal dining area, and a kitchen with a breakfast area. 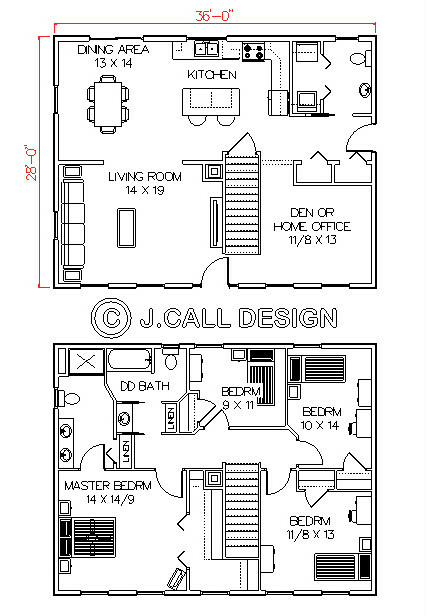 The second floor offers 3 decent sized kids bedrooms that share a double duty bathroom. The master suite has large closets and enough room for a sitting area. The home also has a 2 car garage. If you'd like a larger garage we can do that. 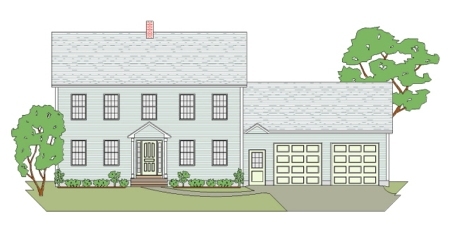 This traditional 4 bedroom colonial home plan has the same floor plan as the Ashland B with minor exterior changes for enhanced curb appeal. It has the same first floor that shines with a large living room, formal dining area, and a kitchen with a breakfast area. The second floor offers 3 decent sized kids bedrooms that share a double duty bathroom. The master suite has large closets and enough room for a sitting area. The home also has a 2 car garage. If you'd like a larger garage we can do that. 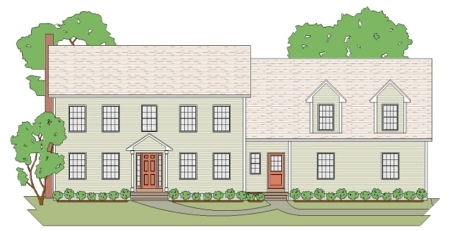 This traditional 4 bedroom colonial home plan looks good in any development in New England. The first floor has a kitchen with a breakfast area, a formal dining room, and a large living room. The upstairs has 3 comfortable kids rooms and a home office or study that could be a 5th bedroom. The master suite is large enough for a sitting area or a exercise area. The two car garage could be made larger if you like. 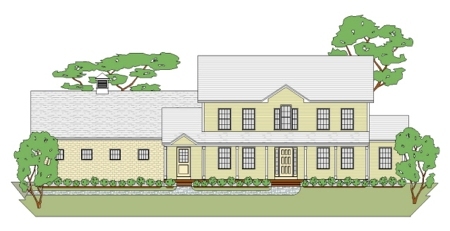 This is a traditional 4 bedroom colonial home plan that has a lot going for it. The first floor boasts a country kitchen with a bump-out breakfast bay and a fireplace, a living room and a formal dining room. The second floor offers 3 large kids bedrooms that share a double duty bathroom, a laundry room, and a great master suite with a beautiful master bath and large walk-in closet. The 2 car garage has easy entry to the full cellar. If you'd like a larger garage we can do that. 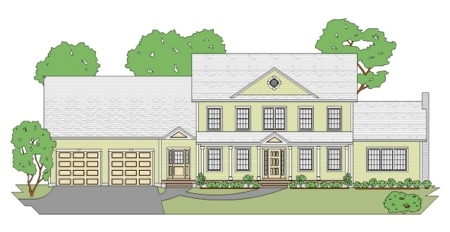 This beautiful traditional 4 bedroom colonial home plan has many amenities. The first floor shines with a country kitchen with a breakfast area, a formal dining room, a family room with a tray ceiling and a fireplace, and a den, home office, or formal living room. Not to be outdone, the second floor offers 3 nice sized kids bedrooms that share a double duty bathroom, a large laundry room and a master suite that is a secluded hide away for rest and relaxation. The 2 car garage has our easy access to the full cellar. If you'd like a larger garage we can do that. 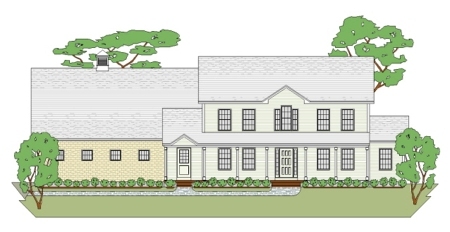 Like the Millbridge A this 3 or 4 bedroom traditional colonial home plan has the look of an old farmhouse, but the inside is designed for today's living. The first floor has an open concept living area, a formal dining room, a den, home office or 4th bedroom, and a full bath. Upstairs are two large kids rooms which share a double duty bathroom, a laundry, and a great master suite. This plan has a large man cave or recreation room above the the large garage that will fit 3 cars and has our easy entry to the full cellar.